My new article on the women's fight in Iran against mandatory hijab and the deep silence of Western women's rights organizations. One of the issues highlighted by the recent Iran protests was the mandatory veiling Iranian women have been subjected to by the Islamic Regime for over four decades. One of the first laws the Islamic Regime enforced was the compulsory hijab. Despite nationwide protests by both women and men, the regime was able to impose mandatory hijab by using brutal force, arrests, imprisonment and lashings. 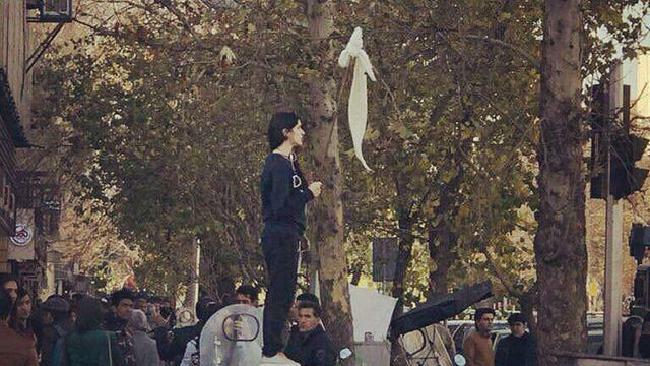 Even today not wearing the mandatory hijab or protesting against it is a criminal offence in Iran, with severe consequences. For over four decades Iranian women have been fighting against this oppressive law at every opportunity, knowing full well the implications for such defiance. In May of 2017, the campaign of “White Wednesdays” commenced, and many Iranian women who opposed the mandatory veiling took off their headscarves in public and waived a white headscarf to raise awareness about Iranian women’s fight against this law.